Attention – Wreck chasers, Aviation archaeologists, outdoor adventurists, & WWII-era aircraft restorers! Wreck chasing, or aviation archaeology, is a fast-growing hobby that combines detective work with the outdoors. Enjoy the sense of discovery as you look through page after page of thousands of aircraft crash sites listed from all across the nation. You'll probably find many that are just a short drive from your home. Whether you're a novice of an old hand, The Wreck Chaser's Bible is filled with basic data essential to beginning any search - latitude and longitude, crash date, type of aircraft, and when available, other vital data that will aid you in locating the crash. The Wreck Chaser's Bible answers many of the questions a first-time wreck chaser may ask, and provides numerous resources and aids to begin the many adventures that await. In total, The Wreck Chaser's Bible includes crash site information in all the lower 48 states plus Hawaii (Alaska has it's own dedicated volume which is also available). Each volume is bound with plastic combs, for easy field or reference use. Written in jargon-free vocabulary, The Wreck Chaser's Bible will provide you with a good foundation to begin your research and locate aircraft crash sites while enjoying the sense of accomplishment associated with this form of recreation. Here's an example of the type of data the pages of the Wreck Chaser's Bible are filled with. You like? If you have ever thought of finding a crash site, dreamed of recovering an old aircraft for restoration or are currently restoring an old military airplane – this is a MUST HAVE book! Includes notable aircraft wrecks such as F-117s, B-17s, the XB-70, and much more! 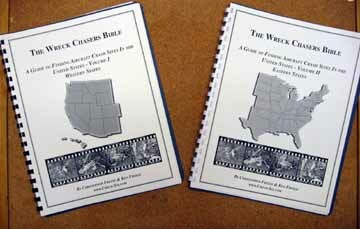 "The Wreck Chaser's Bible" is offered in two specific versions: Both share the same instructional information, but differ as to their geographic content. One for those in states west of the Rocky Mountains, and another for those in states east of the Rockies.